Bakerviewrags is a quality home based TICA registered Ragdoll cattery located in Northwest Washington State with a gorgeous view of Mt. Baker and a short walk to the Ocean. Kittens grow up accustomed to those relaxing salty ocean breezes! A customer came into our Ice Cream Shop telling us about a cat that jumped off a patio – landing on our ‘ragtop’ Jeep! It was a fateful introduction! 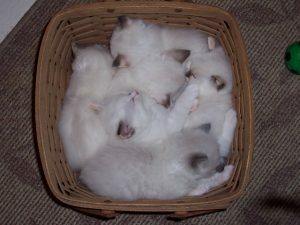 We have been breeding Ragdoll kittens for over 13 years now. Previously located on the Canadian side of the border in White Rock, many of our cats carry our Whiterockrags cattery name. Relocating to Washington State brought about a need for a change in name only to – Bakerviewrags. In breeding we are always striving to produce that ‘perfect’ Ragdoll that conforms to the Ragdoll Standard for the Show Rings! 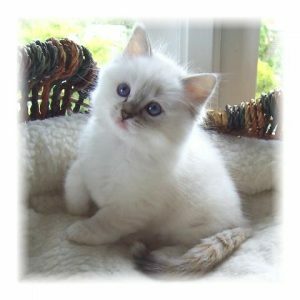 Our ultimate goal in breeding is to produce healthy, happy, socialized Ragdoll kittens with that unique and wonderful Ragdoll personality. Kittens are lovingly raised underfoot as part of our family. They are cuddled and socialized from birth with our 2-legged as well as 4-legged family. We started our breeding with a Tortie girl and very soon added a blue lynx point girl and over the years have added more colors and patterns as each is so appealing and unique! Our next venture – along with Kristie of Olympia Ragdolls – will be working with Cinnamon and Fawn completing our color palette! Cattery and kittens are registered with TICA (The International Cat Association). Our kittens are individually assessed for adoption readiness, generally between 11-13 weeks of age. They will have received their age appropriate vaccinations, deworming, and a 2-year health guarantee. Breeder lines have been tested as negative for HCM and PKD. We are less than 2 hours north of Seattle Washington and service clients in Washington, Oregon and Idaho as well as across the border in Canada. Shipping is available if needed to get your furry one to you! We can make it happen! Kittens are available to reserve! We also have new litters that will be posted in the next few days. The new litters will include seal, blue, red, chocolate and lilac including lynx and patterns will include points, mitted and bicolor. Place a deposit NOW to reserve your CHRISTMAS kitten!!! Take a look at our most current kittens for sale here. “I must begin by thanking you for my beautiful boy Nero. He came into my life shortly after I lost my beloved Himalayan Moses of almost 15 years. With both of us heartbroken I hoped a Ragdoll would be the right fit for my Persian who was 10 at the time. Little did I know Nero would bring the kitten back in Hershey, they would become the best of friends, and manage to help heal both our hearts. He was almost totally white, red tail, and these big blue eyes when he initially arrived. Being my first Ragdoll I had no ideal how beautiful he would be 3 years later! Nor did I ever imagine that I would show him at 16 months in a handful of cat shows to his Quadruple Grand Champion Alter status, and number one Ragdoll Alter in the region that year. His beauty aside I couldn’t ask for a sweeter more loving companion. He is with me all the time going from room to room with me, and waiting in the window for me to come home each and every day. How could anyone resist having another…. I certainly couldn’t, and must again thank you for the next beautiful addition to my family. Levi couldn’t be more different from Nero in so many ways, yet he very much the same loving companion. As I am writing this Levi is dropping toys at my feet for me to throw and retrieve. What a doll he is!!! From his beautiful blue eyes, and sweet expression, to his therapeutic purrs!